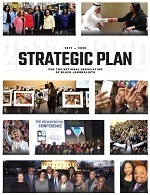 DETROIT, MI (AUGUST 2, 2018) - Hundreds of journalists and media professionals filled the Columbus Ballroom of the Detroit Marriott hotel to put in motion the 2018 National Association of Black Journalists Convention and Career Fair. Known as the largest career fair for journalists in the nation, NABJ18 began with an opening ceremony sponsored by the Chan Zuckerberg Initiative and emceed by Detroit’s very own Felecia Henderson (The Detroit News) and Andrew Humphrey (WDIV-Local 4). Convention-goers were greeted by the sound of Spectrum, a musical group all the way from the U.S. Virgin Islands. Honorary convention co-chairs and Detroiters Jemele Hill (“The Undefeated”) and Rochelle Riley (Detroit Free Press) addressed the crowd with their excitement about the convention’s return to the Motor City after 26 years. Detroit Mayor Mike Duggan, Wayne County Executive Warren Evans and Detroit Police Chief James Craig were also in attendance. Detroit City Council President Brenda Jones presented NABJ President Sarah Glover with a testimonial resolution from the council. Convention-goers were encouraged to take some time to explore Detroit in addition to its downtown and midtown. NABJ Passports were handed to attendees as they made their way to the Disney-sponsored Welcome Reception. The passports included several premiere destinations across Detroit such as the Charles H. Wright Museum, the Motown Museum, Bert’s Warehouse and many more. If attendees visit five places and receive Passport stamps, they’ll be entered into a raffle for $1,000. 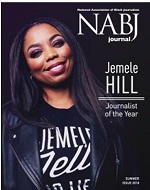 A winner will be announced during the NABJ Salute to Excellence Gala on Saturday, August 4. NABJ Region II Director Vickie Thomas (WWJ) and Detroit Chapter-NABJ President Vince McCraw also expressed their excitement about the convention’s return to Detroit. “We asked you to meet us in the D and you all came out in full force,” Thomas said.